Holy Name Parish began about 190 years in ago in 1871. It began as a mission parish served by the Franciscans. The "Mother Church" which provided the priests came from St. Stephens in Hamilton. (now St. Julie). 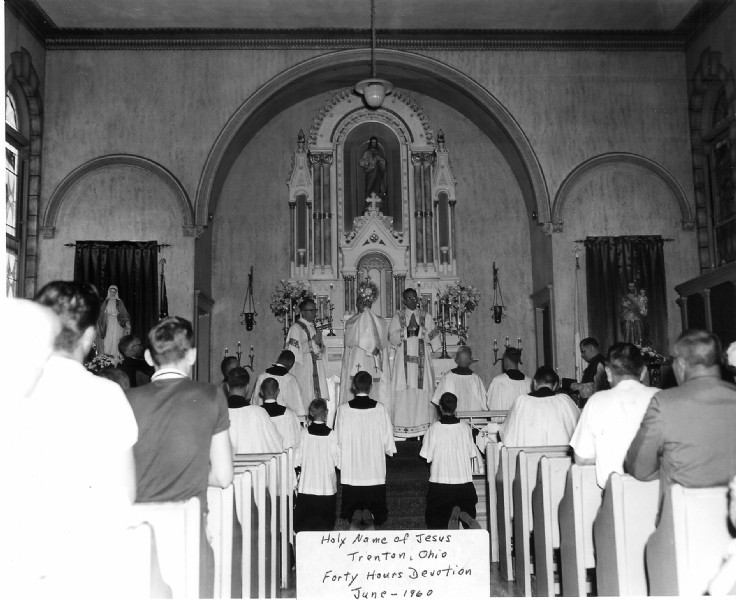 The first Holy Mass took place in a parishioner's harness shop on North Miami Street until the first church was built, (60 by 30 feet) and completed in late 1871. The Franciscans continued to serve the parish until the Archdiocese assigned the first resident pastor, Fr. William Hilvert, to Holy Name in January 1944. In 1821, the year the Archdiocese began there were some 5,000 Catholics scattered over Ohio, Michigan and Wisconsin which comprised the diocese of that time. Tiny Trenton under 100 people had just changed the name of the village from Bloomfield to Trenton, OH, to acquire a post office. By 1850, the large influx of German Catholics had boosted the number of Catholics in the Archdiocese to 245,000 and by 1870 the number had tripled, Trenton too, had shown growth, but of a more modest number to under 300. Christian churches had come to Trenton early. The Baptists were the first to establish a church in the area in the year 1802. They were followed by the Mennonites in 1830, the Lutherans in 1859 and 11 years later the Catholics founded Holy Name in 1871. A lot for the church with an adjoining cemetery was purchased for $237.50. St Stephen Church in Hamilton (established in 1848) had been the mother church for Holy Name as she solicited funds to build a daughter church in Trenton. The current church was completed in January of 1961. In 1970 the parish built a rectory to house a priest and in Spring of 1993 the Parish Center was completed. The parish center has a large hall and six classrooms. This allowed a place to educate children and adults in the faith as well as provide rooms for parish groups to meet and other parish activities.